Beaches Water Cooperative does not have a Boil Water Advisory in place. Home About Us Contact Us People Rules & By-Laws Make a Payment Newsletters / CCRs Water Meters The Board of Directors meets at the Beaches Water Co-operative office, generally on the second Thursday evening of the month. The Business Manager receives direction from the Board for the day-to-day operation of the Water Co-operative. The Beaches Water Co-operative consists of five pumping stations with a total of eight wells. All five stations are normally in operation supplying water to almost 800 homes in the communities of Long Beach, Calvert Beach, Cherry Lane Farms, Kings Creek II, and Calvert Beach Estates II. Controls cycle the pumping stations on and off as needed. The system has sufficient capacity to add a good number of new homes which allows us to shutdown pumping stations for repairs and maintenance. Sections of the water system are over 40 years old and require periodic repair. We have had numerous leaks in the system, mostly with black plastic piping. The typical leak is repaired in-place with no interruption of service. We are fixing all minor repairs and additions are performed by our contract plumber. As part of our operational goals, we seek to minimize interruption of service. When necessary to shutdown a section of the system, we will post signs in the affected areas, a day in advance. Future plans also call for additional isolation valves which will allow us to shutdown smaller sections of the community without affecting the entire system. Beaches Water Co-operative is responsible for the water service up-to and including the corporation stop valve which is located at the curb box at the street. Whenever possible, we will work with the homeowner to coordinate repairs to their side of the line. In these cases, we will come out and turn the water on and off as needed. The corporation stop valve shall not be operated by anyone other than water company personnel. We have improved our bill processing, and with billing handled from our office during the day, most questions are resolved immediately. Issues with the water system can also be quickly evaluated. The Beaches Water Co-operative Rules have been updated to allow the Business Manager to process past due accounts. 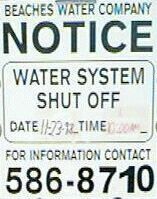 Water service is interrupted if a past due account is not paid. The water provided to each member is groundwater, pumped from any of our eight deep wells in the system. These large production wells meet current demand standards and are expected to supply adequate amounts of water well into the next century. Water is treated with gaseous or liquid chlorine within the treatment plant and then stored in a local tank which is pressure fed to the distribution system. Chlorine residuals are tested daily, and water quality is monitored through monthly operational reports and routine inspections administered by the Maryland State Department of the Environment, and by the federal EPA. Currently, under provisions of the Safe Water Drinking Act (SWDA), water quality is monitored for over 80 potential contaminants. Accordingly, BWC is operating in full compliance with all water standards under SDWA and enforced by EPA. If we should ever fail to meet these standards, all affected members would be notified immediately. 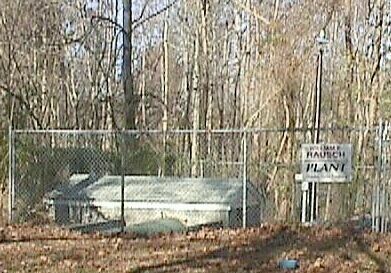 The water system supplies 105,000 gallons of water per day to our members, as well as providing fire protection at any one of our 20 fire hydrant locations. "The William E. Rausch Plant"